Spellspire is the latest console release from eclectic indie developer 10tons, and, for better or worse, it doesn’t stray far from its mobile roots. 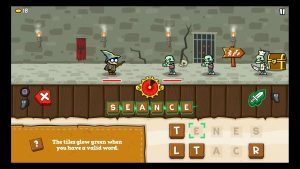 In Spellspire, the player plays as a wizard who must fight his way through rows of enemies to the top of a one-hundred-floor tower by expeditiously spelling three- to ten-letter words using a set of ten letters. 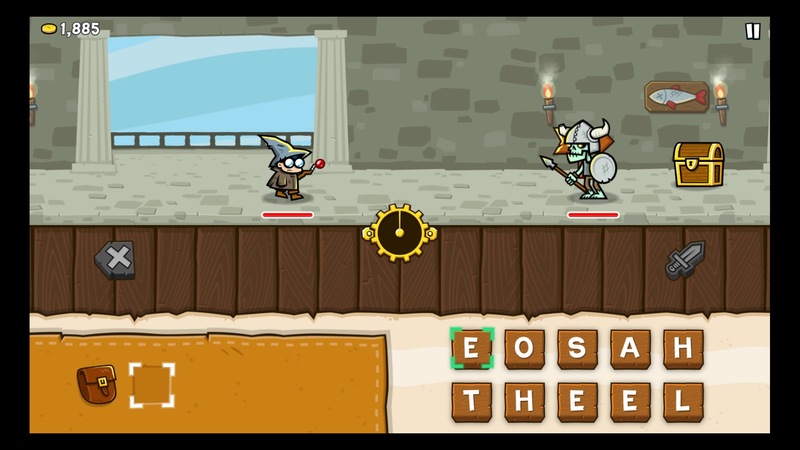 Each word the player spells deals damage to the monster the player is facing, until eventually enough damage is dealt to fall that monster and move on to the next monster or, if there are no monsters remaining, complete the level. 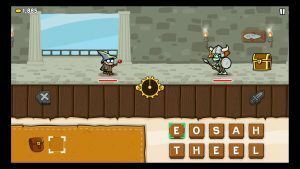 It’s a simple premise, rooted in words games of the past, from the perennial classic Scrabble to the weekly Spelling Bee in the New York Times Magazine combined with light RPG trappings and simple side-scrolling combat of mobile games like 10000000. 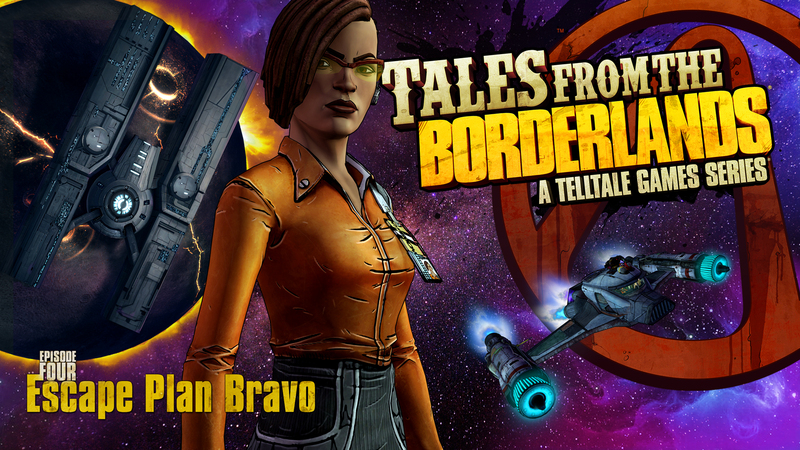 As is the case with many mobile games, the narrative is a hollow premise to engage the player in addictive gameplay, then loop them back in with slight variations in level design and challenge. I found the general narrative and accompanying art direction to be inoffensive but bland, offering me no real reason to continue climbing the tower. If the enemies were a little more interesting, or if the levels of the castles more aesthetically varied, there might have been more reason to climb instead of progress for the sake of progress, but there isn’t. It also doesn’t help matters that the game’s audio is very limited, and the same song seems to play on almost every level. Personally, I played through most of the game with the volume off because I felt so sick of hearing the same handful of sounds and rhythms on repeat. This is passable for a mobile game, but feels like a substantial blemish when contextualizing it as a fifteen hour console experience. Spellspire’s greatest success is probably its core mechanic — spelling. Selecting the right combination of words to best a foe can be very satisfying, especially towards the ends of later levels when you might feel pressed to squeeze the last acronymic juice out of your letter set. On top of this, certain items (such as multiple types of dictionaries which spell a word for you) can provide insight into letter combinations, prefixes, and suffixes you hadn’t yet thought of while being fun to use. Outside of some occasionally questionable tile arrangements and wonky controls, spelling works surprisingly well as a combat mechanic. Landing huge wallops by stringing letters into seven or eight word combos feels rewarding, and strategizing when to use long or short words based on the current battle adds a layer of complexity necessary to keep the game engaging after a few floors. Although I would have liked some greater diversity in items and more contextual thinking about why I might spell certain words at certain times, the basic gameplay is solid and addicting. Even as someone who isn’t always drawn to word games, I had a hard time putting the game down in its first couple hours. However, this spelling gameplay is layered with an RPG dressing that I felt detracted from the core experience while adding very little. As you play through the game, you gradually accrue gold that you can use to buy new weapons and armor. Although these upgrades could have been an opportunity to add some diversity to a fairly monotonous experience, they mostly just increase your attack and defense, sometimes being super effective or less effective against particular monsters. Deciding which loadout to use to take advantage of enemy weaknesses is not intuitive, interesting, or rewarding, and fumbling around in the monster encyclopedia to double-check enemy weakness is a frustrating waste of time that only subtracts from the spelling gameplay. In fact, once I unlocked the final and most powerful weapons and armor, I was elated I would probably never again have to consult the game’s bestiary or change my loadout. This annoyance is further compounded by an awkwardly organized menu and curious default selections on the menu screen, which resulted in me upgrading weapons and armor several times when I only intended to select them. At their best, RPGs can make players feel like they’re exploring another world and growing throughout their experience. 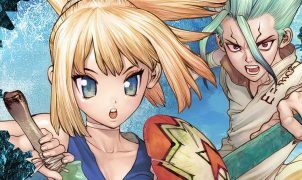 But the superfluous and shallow RPG mechanics tacked onto Spellspire go to show that without balance, world-building, and interesting design, RPG mechanics don’t necessarily make for an RPG experience. 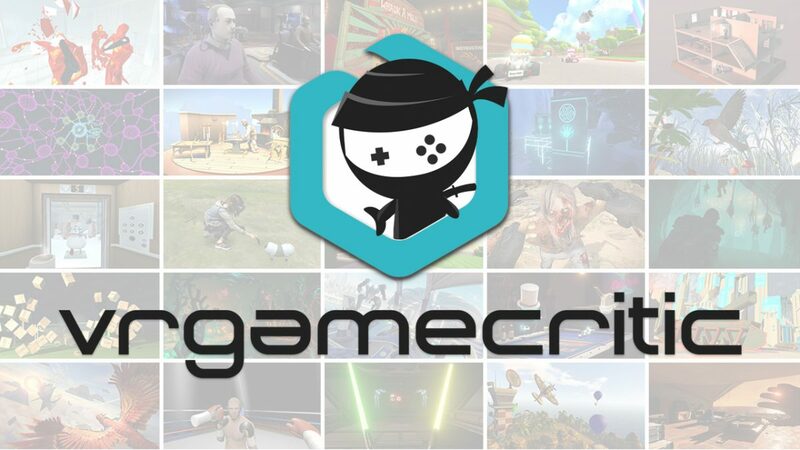 Outside of its half-hearted RPG intimations and the general monotony one might expect of a grindy mobile game, most of my complains about the gameplay are relatively minor. However, I do think that not only these flaws, but myriad smaller ones become more salient when seeing Spellspire as the console game it is judged as in this review. For example, the issue with I mentioned above about accidentally leveling up weapons and armor would not pertain to a mobile game where the player would have to press one of two buttons on a screen. But by making one option (the less frequently used and more consequential one in this case) the default, the game sets up a scenario where the player will probably sometimes accidentally purchase an item he does not want to purchase. 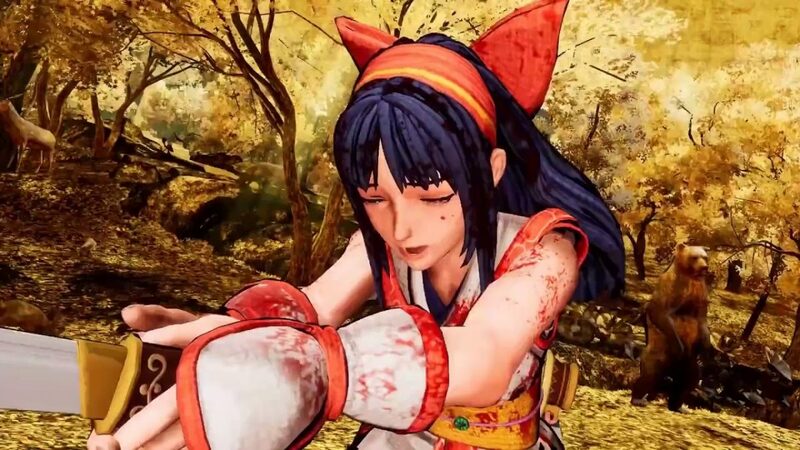 This seemingly tiny flaw on its own is not a game-breaker, but bundled with all the other similar tiny flaws that seem to have arisen in its move to console, the game feels unnecessarily sloppy and unintuitive. The game is also extremely monotonous, offering little in way of variety to differentiate one level from the next. This uniformity, occasionally interrupted by difficulty spikes (likely intended as a cash grab in the mobile version and not adequately balanced here) makes for a game that is fun at the outset but quickly grows tiresome. Seeing these kinds of issues arise in a console game (although they may be less annoying to a player playing in ten minute increments on the subway), only justifies the widespread belief that the mobile market has put a damper on video games as a medium. There is not ample room for improvement in terms of broad design decisions, but a multitude of minor defects. And while the gameplay alone is fun for the first few hours, as a game asking to be played on a television screen (for presumably longer play sessions than on a mobile device the game was designed for), the game peters out about one third of the way up the tower. On the whole, Spellspire for PS4 feels like a lazy port of a mobile game that wasn’t entirely thought through. It’s riddled with questionable design decisions that might work better on mobile, but can ruin the entire experience on console. Add to this the lack of a true adventure mode, any kind of multiplayer (which could have been a ton of fun), and minor gameplay and control decisions that make the experience often obtuse and clunky, and the game becomes an interesting idea weighed down by its surroundings, like a promising seed planted in the wrong plot of soil and not given enough care to sprout. 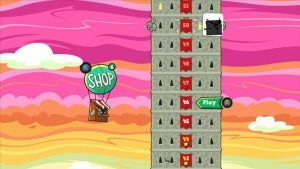 As a whole, Spellspire is an interesting premise mired in a host of problems, many of which stem from its mobile-based attributes translating poorly to console. But for consumers, perhaps the greatest strike against it is its $10 price point. 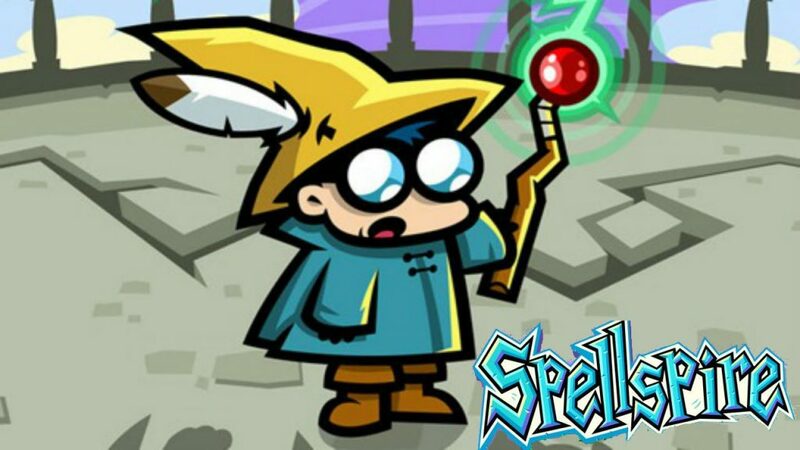 While this might be a bargain for the handful of spelling addicts who could sink hundreds of dollars into the mobile version, for most gamers curious about Spellspire I would recommend downloading the mobile version and spending your $10 elsewhere. For that same amount of money, you could get Shovel Knight: Specter of Torment, or if you’re looking for a puzzle experience and own a 3DS you could buy two superb BoxBoy! games for the same price. 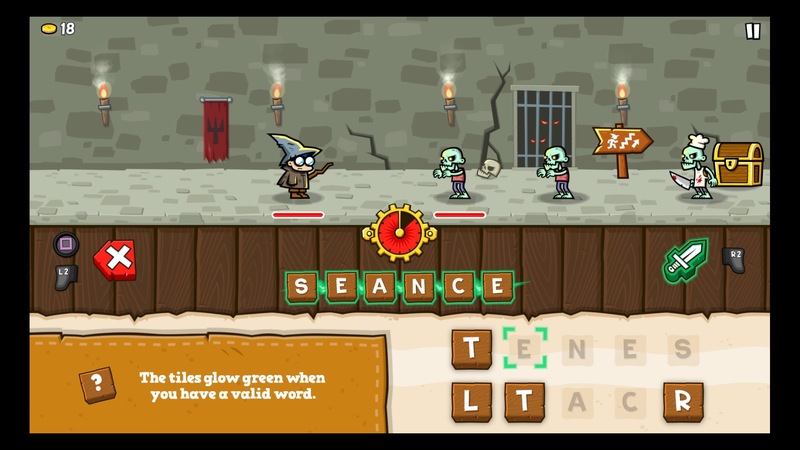 This isn’t to say that Spellspire isn’t worth your money, because it might be if you love word games and want a word puzzler to play on console for potentially hours on end. But even then I suggest trying the mobile version first — Spellspire is a game built for phones and gains little while losing a lot in its move to a large screen, controller-based, mandated stationary play of the console ecosystem. Kyle has been playing video games since he was old enough to know it was the secret to becoming socioeconomically elite, probably since he was three or so. He wrote about them too formally for awhile and got a PhD doing that, and now he writes about them less formally at more of a meager MA level. When he's not playing or writing about playing, he's probably doing a different fun thing. Or he's not doing something fun, but don't feel too bad for him because he still gets to write about playing games.